Regina has been knocking on our door with pork fillets, again … We are so lucky. Thankyou, Regina. I searched my books for another recipe to do justice to the beautiful pork and I came across another one from The French Kitchen by Joanne Harris and Fran Warde. 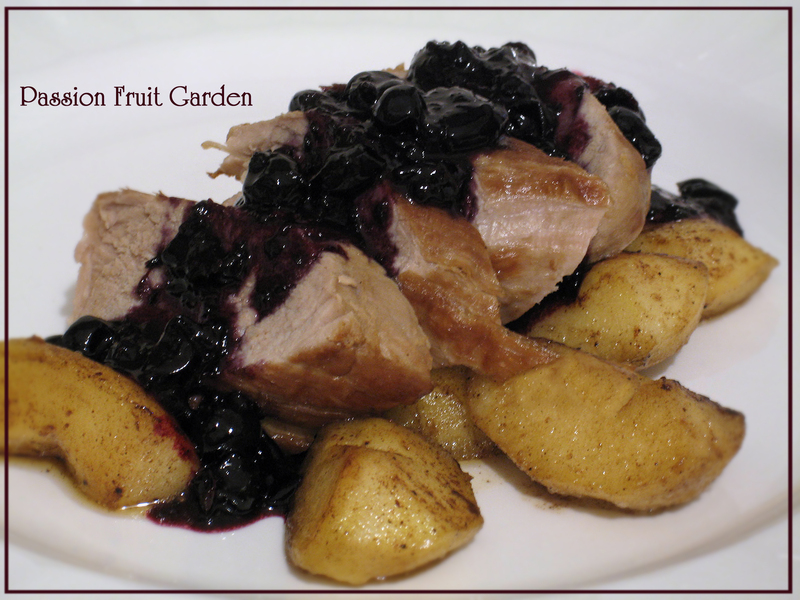 This recipe appealed because I am big on serving fruit as part of a main meal. Apples go with pork and I imagined the acidity of the blackcurrants would be a perfect foil for the meat. The first issue we had was: where do you buy blackcurrants in Perth? None of the supermarkets sell them nor any of the gourmet shops out our way. Eventually, we found Maison Felix, an on-line French delicatessen that delivers within the Perth metro area. Luke sells all things French … and frozen Chinese blackcurrants imported by a NSW company:) I know, that is a lot of food miles. Do we grow blackcurrants in Australia? The blackcurrant jam we bought was made from ‘imported ingredients’, so maybe not. As we were concerned about the disproportionate cost of having a bag of frozen blackcurrants delivered to our door, Maus picked them up. We were now set for our fine meal. We invited Regina over to thank her for the pork. The recipe was very nice except the blackcurrants were very tart, tarter than I imagined they would be. The recipe calls for 1 tsp of blackcurrant jam and 2 tsp of sugar. Even though I tasted the sauce and realised it was tart, I didn’t add more sugar because I thought the pork would mellow the tartness. If I made this recipe again, I would increase the amount of jam and/or sugar. Put the blackcurrants, water and sugar in a small saucepan and gently bring to the boil. Remove from the heat and let cool a little. Strain the fruit. Set aside the strained fruit and the juice. Heat some olive oil in a pan and fry the pork until golden all over. Season with the salt and pepper, lower the heat, cover and cook until cooked through (15 minutes or so). Set aside and keep warm. While the pork is cooking, heat the extra butter in another pan and fry the apples until golden brown. Sprinkle a pinch or two of cinnamon on top. Add the blackcurrant juice and jam to the pan the pork was cooked in. Bring to the boil. Add the 50g of butter to the pan. Whisk until the sauce is nice and glossy. 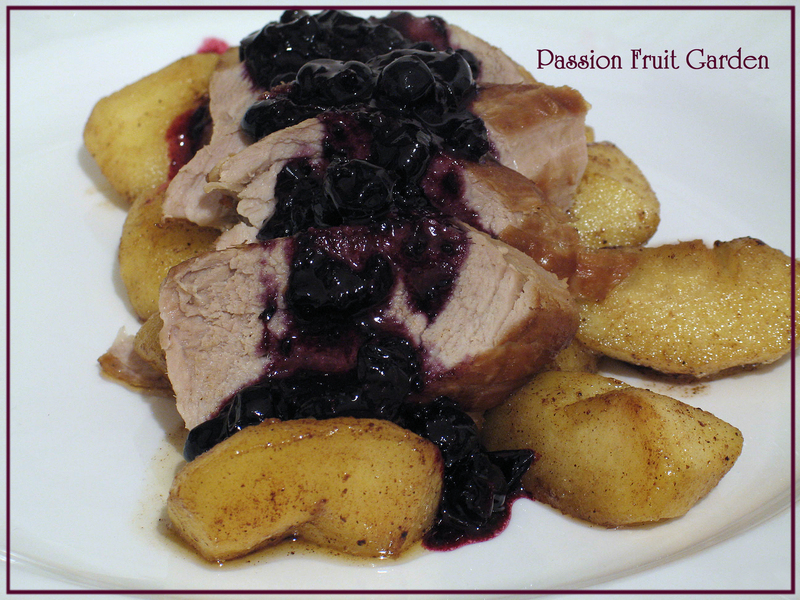 Serve the pork on the apple pieces, topped with the blackcurrant sauce. This entry was posted in Pork, What's for dinner? and tagged Apple and pork, French delicatessen in Perth, Joanne Harris & Fran Warde, Pork fillet recipes, Where to find blackcurrants in Perth? by Glenda. Bookmark the permalink. oh how funny. I had some nice spring lamb chops that needed cooking and I made them only an hour ago for the fellas. To liven them up a little I tossed them in my Lilly Pilly Jelly to give them a lovely sweet/acidic glaze. They loved them. I understand where you’re coming from with the pork and fruit combos. Hi Mariana Lilly Pilly Jelly – now that is more like it. Getting blackcurrants was very difficult and lots and lots of food miles were involved. Now that I have tasted them and know the flavour they bring, any tart acidic fruit would do the trick. Hmm. Yes I think we live in times where food miles count! Fortunately I only have to step outside my backyard or go to the farm to get my lilly pillies, when in season of course. Hi Celia, They were bloody tart, I would never haved guessed but with a bit more sugar they would be perfect. The pork needs the tartness. I admire your insistence on authenticity – I’d probably sub cranberries as the easy way out. But, if that’s your fun, have at it! Certainly does look delicious. Hi Doc, Cranberries would be harder to find. I have only ever seen dried cranberries here and that has only been in the last 5 years. Before that, we could only get raisins, sultanas and currants. We can get frozen blueberries and raspberries but they wouldn’t cut the mustard. Anyway, now I know blackcurrants are tart.